Located in Jordan village 20 minutes from Niagara Falls, Cave Springs wine cellar dates back to 1871, and is the oldest functioning wine cellar in all of Ontario. 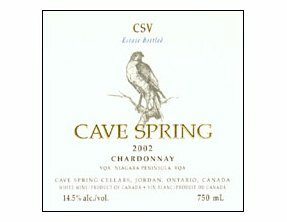 Cave Spring Cellars uses only vinified vitis vinifera grapes grown on the Beamsville Bench, a unique micro climate that extends 15 km on the Niagara escarpment, this unique climate protects the vines from frost damage. Wine tours including the oldest underground cellar in Ontario, tastings, and a fine dining restaurant serving Cave Spring wine is available. Cave Spring wines are made from vitis vinifera, the classic grape varieties of Europe. By working with classic varieties which are well suited to Niagara’s cool climate, Cave Springs’ winemakers are able to capture the goût de terroir which makes the Beamsville Bench unique. Situated on the finest slopes of the Beamsville Bench, the Cave Spring Estate was first planted in 1978, making it one of Niagara’s most mature vinifera vineyards. By planting at densities of 4500 vines per hectare, twice Niagara’s average, we are able to increase competition among the vines for vital ground nutrients.